With all the Nexus devices now having OTA links and factory images online and available, the update is starting to make its way to the Wear lineup. 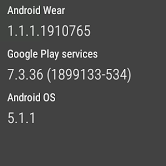 Now 5.1.1 brings a few new great features to Wear, some you'll like, some you'll love. +Sivan Rehan talked about it during the show last night... but if you missed her talk about it, there's some great new features and layouts - and then also some issues. For a fuller walk through look forward to an article from Sivan or myself (whenever my G Watch gets it). Looks like right now the update is rolling out to the LG lineup (Urbane, G Watch R, G Watch) and the Asus Zenwatch with others coming out down the road. Most likely these ones first as they don't have the Wifi chip - which 5.1.1 now starts to work with properly. Don't mind me, I'll just be here waiting for my update.